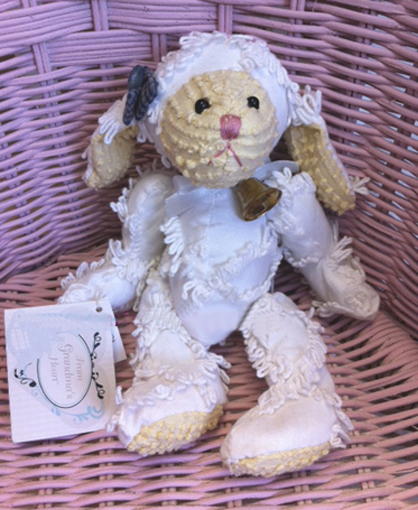 Home > Seasonal & Special Occasions > Easter Gift Ideas > Chenille Lamb Melinda from Grandma's Heart 8"
This small 8 inch Chenille Melinda Lamb is from a company called Grandma's Heart which was a Division of Mill Mountain and was designed by artist Karen Drayne. Grandma's Heart is no longer in business and these little chenille cuties are very hard to find now. This plush Chenille Lamb was introduced in 1999. It is in mint condition. The arms and legs are attached and this lamb is floppy and posable. It is made from vintage style Chenille white and yellow fabric so it looks like it was made from old chenille bedspreads. Melinda is wearing a small bell tied with a ribbon around her neck. She has all her original tags. Remmeber your favorite sweater and how you would pull on the buttons? I made this little friend with you in mind and with matching buttons just like yours.